Textile and garment exports are set for a boom this year, according to the Vietnam Industrial and Trade Information Centre (VITIC), a Ministry of Industry and Trade agency. The US topped the list of importers, buying textiles and apparel worth nearly $926.7 million, or nearly half of Viet Nam's total exports. Japan and South Korea also bought more than $100 million worth of products. n January exports were worth over 1.9 billion USD, marginally up from last year, but many companies in the textile and garment industry have received orders to be executed in the first and second quarters. The US topped the list of importers, buying textiles and apparel worth nearly 926.7 million USD, or nearly half of Vietnam's total exports. Japan and the Republic of Korea also bought more than 100 million USD worth of products. The full year's exports to the US are expected to top 11 billion USD, a year-on-year increase of 13 percent. 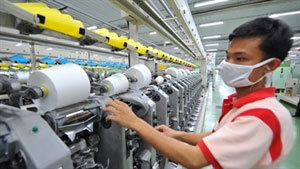 Japanese firms' increasing investment in supporting industries in Vietnam has created favourable conditions for the textile and garment industry, VITIC said. Exports to Japan are expected to rise by 9 percent this year to 2.9 billion USD. VITIC said once a free trade agreement with the EU is wrapped up, exports of textiles and garments to that market would begin to rise, reaching 4 billion USD this year. The Vietnam National Textile and Garment Group (Vinatex) plans to invest 9.4 trillion VND (441.3 million USD) by 2017 in 59 textile, dyeing, garment and infrastructure projects, according to the corporation. They include 15 fibre production projects, 18 textile and dyeing projects,18 garment projects and eight infrastructure projects. Under the plan, Vinatex will disburse 2.425 trillion VND (113.85 million USD) to develop these projects this year, with 805 billion VND (37.8 million USD) going to fibre projects, 713 billion VND (33.5 million USD) to textile anddyeing projects, 726 billion VND (34.1 million USD) to garment projects, and 181 billion VND (8.5 million USD) to infrastructure in industrial zones for the textile and garment industry, reported the Dau tu (Vietnam Investment Review) newspaper. With the investment, Vinatex expects to increase this year its production capacity to 6,000 tonnes of fibre, six million metres of dyed cloth, two million vests and blazers and four million trousers, as well as one million shirts and two million knitwear products. Vinatex is currently considered to have the largest scale in production in the textile and garment industry, with 100 member companies, and holds 15 percent of the total national textile and garment export value. However, the member companies of Vinatex still face difficulties in investment in sub-material production, textile and dyeing projects. Vinatex General Director Le Tien Truong said that the member companies don't have large investment capital, presenting a major challenge for local textile and garment firms in increasing the localisation rate. The Phong Phu Joint Stock Corporation is a member of Vinatex that has the largest capital amount of 700 billion VND (32.86 million USD), while other large member companies have lesser capital, such as Viet Tien with 200 billion VND (9.4 million USD), Garment 10 with 100 billion VND (4.7 million USD), and Nha Be with 150 billion VND (7.05 million USD). The large garment companies could not invest in full supply chains, especially regarding the production of materials and sub-materials for textile and garments, to receive export orders as original design manufacturers (ODM), Truong said. Vinatex has equitised its operations from January 1 this year, he added, so the group will promote management, investment and market and staff development. The parent company will also take on the role of a direct investor to increase production capacity, especially self-reliance in material production, in a move to reduce dependence on imports, rather than manage State-owned capital at its member companies, as it did before equitisation. The group has set a target for its parent company to earn 900 billion VND (42.25 million USD) in revenue and 288.4 billion VND (13.54 million USD) in after-tax profit in 2015; 2.3 trillion VND (107.98 million USD) and 342.3 billion VND (16 million USD) in 2016; and 3.26 trillion VND (152.8 million USD) and 405.9 billion VND (19 million USD) in 2017 respectively.